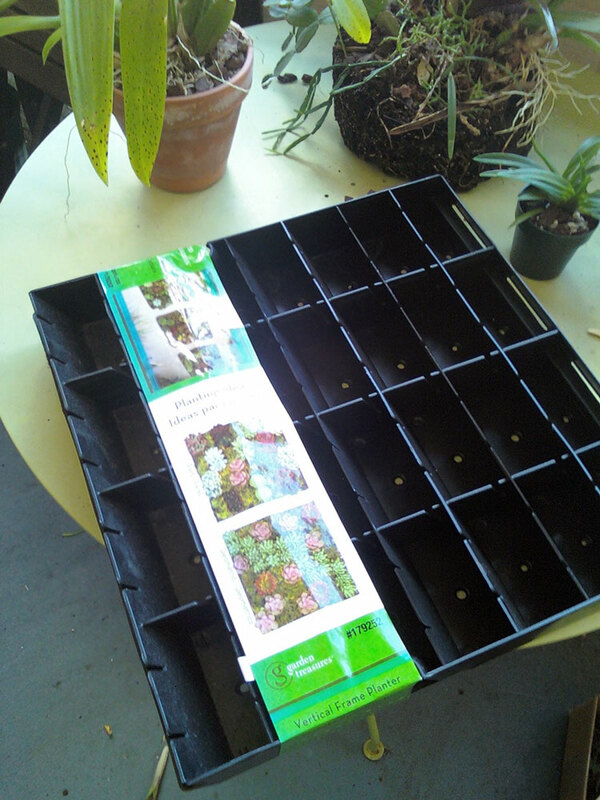 I've got a lot to do this fall, and now that the Florida heat has given way to a brisk and gardener-friendly chill, no more excuses! I'm going to whip my balcony into shape, and transform "The Rainforest Garden" at my parent's place into a green winter wonderland! First off is the balcony. 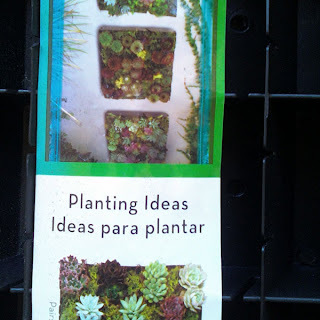 I had been devising all these ideas for vertical gardening, ranging from using ropes laden with bromeliads to hanging burlap sacks filled with bark and planted with orchids. It turns out that for the time being it was just cheaper to buy a ready-made wall planter, even if it is just a knockoff of the amazing succulent wall artistry of Flora Grubb. The only difference is that I plan on using shade loving epiphytes instead! Usually these frames are filled with succulents that require a lot of sun, but not only is my balcony too shady for these succulent tapestries, the soil weighs a lot too! Epiphytes like bromeliads only ask for a bark mix and maybe a little potting soil, and that substrate is much lighter than one that terrestrial plants would ask for. I plan on using rhipsalis varieties, pink cryptanthus, orchids, and ferns. I'll also create a wooden frame to really make a statement! 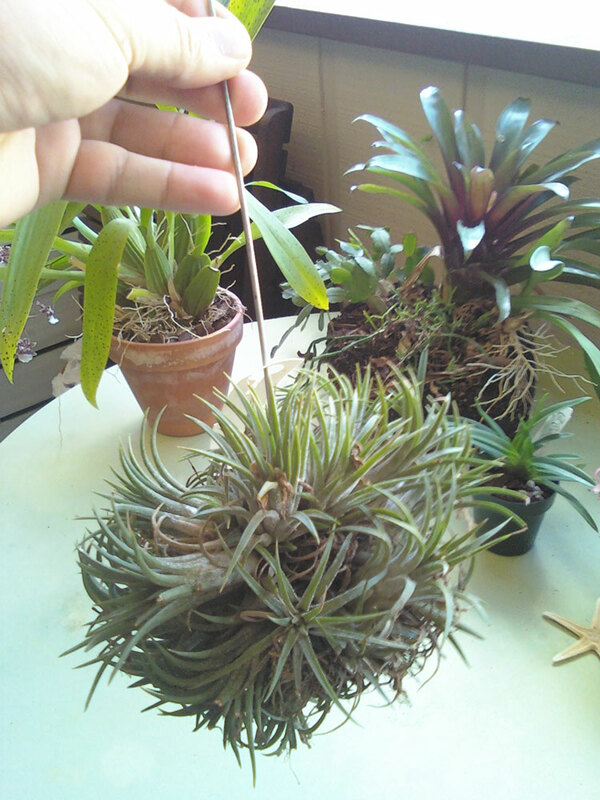 I already have a fair amount of tillandsias, including a big ball of larger specimens hanging from the ceiling. I just picked up a smaller one for a VERY low price, and decided to start a few more while I'm at it. I'll be sure to show you how I do it too! You may have noticed that my balcony table (in the tillandsia pic) had lost its color. Well, actually I don't even think its been in the blog with its original coat of chartreuse green paint! The drier winter air will make for a nice time to give the table a fresh coat of paint so it can match the other chartreuse elements of the balcony. My parents don't want a new garden bed, so rather than dig up the grass I'm planting winter annual vegetables amongst the ornamentals, right alongside the gingers, heliconias and philodendrons. That way I'm making the most out of the most fertile and moist part of the garden, continuing the show after we get a frost, and even providing a little cold protection and a 'living mulch' for the tropical plants. I'm also helping the veggies out by scaling back the tropicals to allow more light, and by adding manure and compost to the planting site. I'll let peas clamber up the ti plants heliconias, gingers and palms, using them as a natural trellis, and affording a little more protection to the cold tender plants. Collard greens and mustard greens will make a nice groundcover in the places where I've cleared out the ground a little. 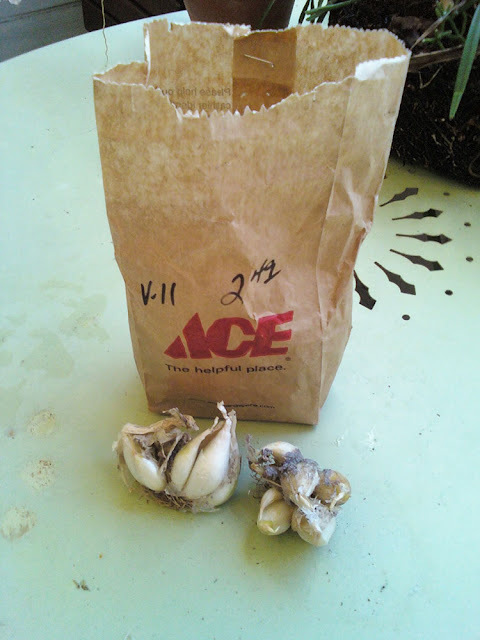 I also found these 'multiplying onions', locally grown. Has anyone else tried growing these? 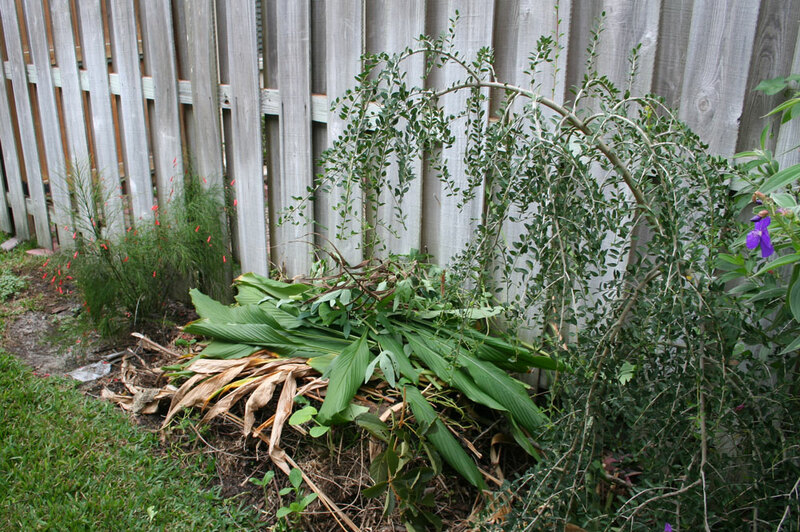 This is a part of my garden I haven't photographed yet, the compost heap! I'm rather new to the business of composting and am afraid to turn over the heap and disturb all the earthworms, frogs and toads that reside there! Maybe this isn't so bad after all. In the book, The Complete Compost Gardening Guide, by Barbara Pleasant and Deborah L. Martin, one of the types of compost heaps mentioned is the Grow Heap, which is a layered pile of slowly decaying compost that you use to grow veggies in as it composts away. You guessed it, I am planning on growing some veggies there this winter, like my winter squashes and maybe some 'new potatoes' if I can find some. Unspeakable evils have been done to this tree by others, and now the only solution is to put it out of its misery. First the builders planted it too close to the house... no wait, that was me when we first moved in. I did that when I wasn't yet gardening and was just completing a chore for my parents. 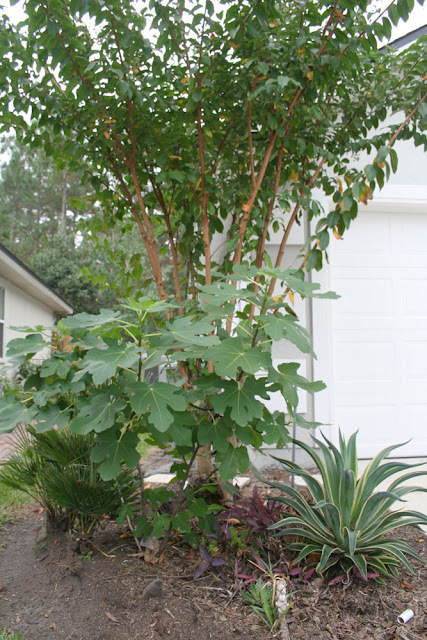 Anyways, it is a large variety of crepe myrtle that was too close to the house to begin with. Then there's Crepe Murder. The lawn people my parents use have also made it a habit to hack it to nubbins every year even though we've asked them not to. Though I've done some corrective pruning, this has ruined the form of the tree and the multiple trunks you see are actually weak water sprouts that have shot up from the stump. I don't want to use poison, so I'm going to pile up soil around the base to kill it naturally. I'll leave the stump in place to plant bromeliads on. Don't judge me... its the wrong plant in the wrong place. Lastly, there's this monstrosity. 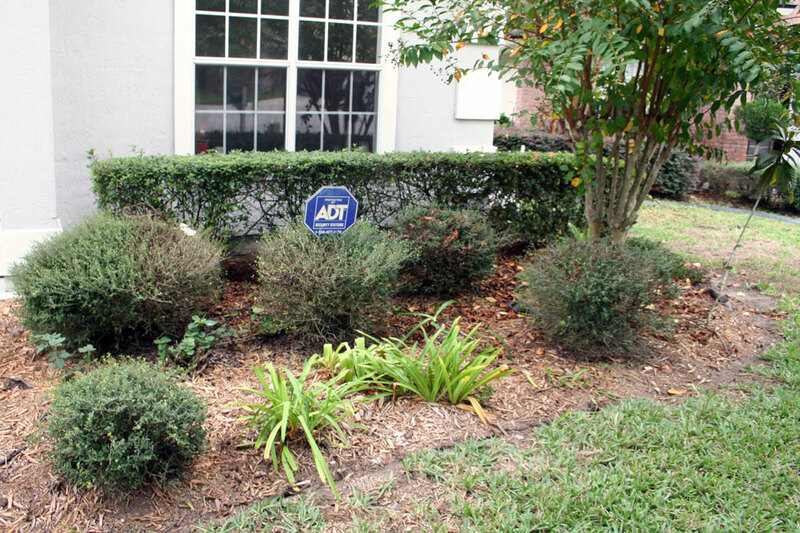 This trouble spot is planted with dwarf burford hollies, that the landscapers trim to insipid rounded shapes every year, and twig disease has spread from their pruners. I have nothing against artfully pruning shrubs with creative purpose and vision, but this is stupid. I actually wouldn't mind letting them grow together to form an organic looking mass, but I need to figure out a way to keep the landscapers from trimming them. Also, this area is drought stricken and sunny. Even the agapanthus and spider lilies have been struggling, and I need to install a soaker hose system... at least so the lily of the niles can get established! Anyone have some advice for my upcoming projects? I look forward to seeing your revamped garden and balcony. I'm sorry about the crepe myrtle. Look forward to to your sharing about starting more Tillandsia. Have a great weekend and happy gardening in this cooler weather we are having. I'd love to see how you make your tillandsia balls! Best of luck on your chores! I'm looking forward to seeing your epiphyte wall hanging. It sounds like a great project. You have some interesting fall plans that should help keep you busy until the spring growing season. I'm trying to catch up on some much needed maintenance around the Path myself. You have some great projects planned - I like the sould of your vertical wall. For that sunny area could you grow things like crotons? there is a very sunny area in town that I am thinking of "copying" for our central sunny traffic divider. It has crotons, a few rocks and some annuals like petunias occasinally. there are also some "hurricane" bromeliads which go quite yellow in the sun but it all seems to work quite well, with no maintenance. I love those Tillandsia balls. Can't wait to see how you make them. I have quite a few of them planted on coral or shells in my kitchen windows. And I clicked on the link for Flora Grubb but I couldn't find the article on wall artistry? I,too,am looking foward to seeing how you make the tillasandia balls.I have some that I found in an oak tree in our backyard.I have them growing in Horse Conch shells.I've done the compost pile thing and it works. Thanks! This cooler weather must have helped this cold to incubate, but the weather's so cozy that I don't care. I'm starting to think that compost heaps are an excellent place to grow veggies in my (usually soggy) garden! They act as raised beds, are nutrient rich, sunny, and have natural mulch! 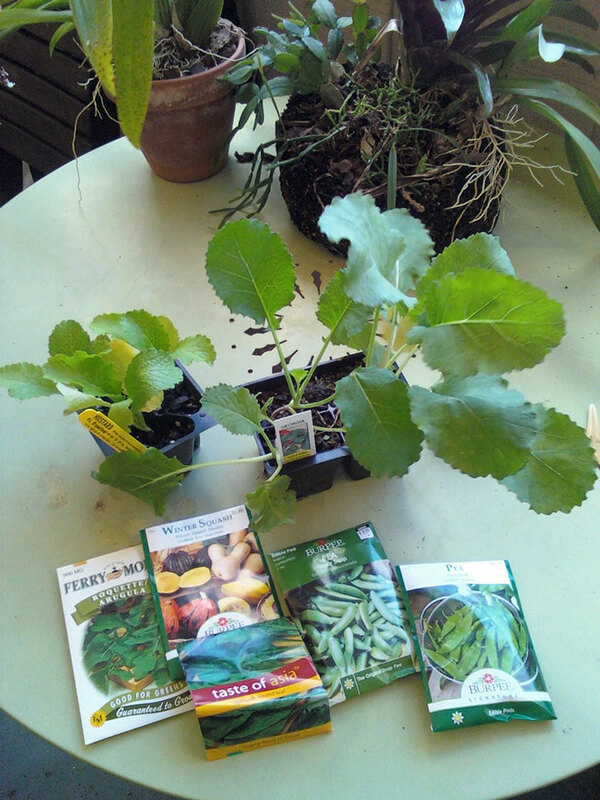 I've put more plant material in that heap than I could have imagined, so perhaps its time I started a new one. Fall really is the best time of year in Florida... everything's hit its stride and the weather's right for gardening. Can't wait to see what you have planned! As tropical as I garden, crotons are still best as annuals here especially in an exposed spot. I do hope to use more bromeliads when the shade fills in, and I also have a clustering sugar palm that would look great framing this bed when there's some more shade. I guess I'm lucky to have an opportunity to plan another bed! The tillandsia balls really make themselves in time and are really easy! I'll do a post on it, but its about as simple as tying a couple together and hanging them! They fill in after a year or so. I'm glad planting in compost works for you too! I'm definitely convinced. Oh, and horse conch shells are awesome.